Can God be Found in the Smaller Things? During my research for my next novel, LUCID, I came across a concept that really got my mind rolling. People have looked to the heavens and its large celestial bodies asking, “Is that where God is?” Looking out into the universe the laws of physics are predictable. The big things like stars and planets operate in measurable ways predicated by the laws of classical physics that have been laid down for hundreds of years. When dealing with subatomic particles or quanta ( Light, Electrons, etc. ), the world of physics becomes unpredictable. This is modern physics, and scientists have only scratched its surface. Quanta can exhibit properties of both a particle and a wave. The curious thing is that when humans watch quanta they appear like particles, but when no one’s looking they move in waves. There lies the dilemma for traditional scientists who operate within a cause/effect paradigm. Scientist’s watch and report, however the sheer act of watching modifies the experiment. Our consciousness appears to change the perception of what we try to observe. An example of this is explained in the double slit experiment. Thus, in quantum physics the scientist must confront the concept that they cannot separate themselves from the experiment as purely a spectator but must accept that they are a player within it. Does consciousness somehow create reality? At the quantum level, it’s suggested that places exist where there’s no past or future–only now. Time doesn’t always move in a straight line. It may only appear to manifest itself in that manner because that’s the way we perceive it. Within this timelessness is where science struggles to break boundaries and understand the big “Whys” that humans have asked since our minds reached beyond our planetary foothold. Maybe it’s in here, within these smallest particles of matter and reality, that one can find the etchings of the divine. Addendum (7-10-12): I posted this a little too early. 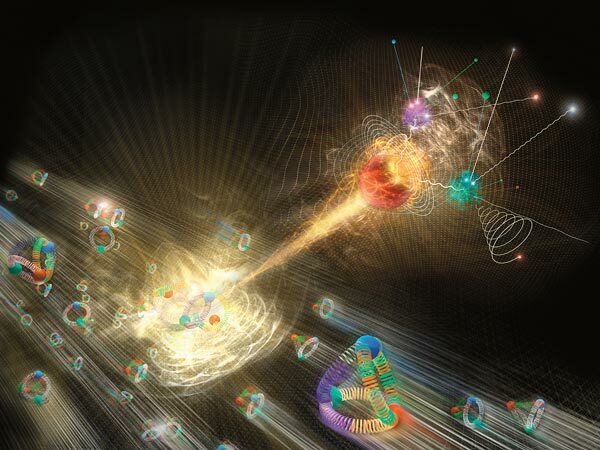 In the first week of July 2012 Geneva reported that its Large Hadron Collider in CERN during its atom smashing experiments believe they have evidence of the God Particle. This is the elusive Higgs Boson particle which scientists have searched for thirty years. It is the particle that is supposed to provide mass. Thus with mass you have gravity. Without gravity then everything in the universe would just be a thick soup of atoms. Galaxies, suns, planets and humans would not exist. See the article in National Geographic News.